Abigail Spencer announced on Instagram that she is coming back to “Grey’s Anatomy.” She posted a photo of herself with red hair saying that Megan Hunt is back on the show. The last time fans saw Hunt on the show was when she was moving to L.A.
With Riggs and her son. According to Extra, Spencer replaced Bridget Regan for the role of Hunt in 2017. 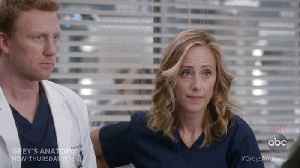 Owen's (Kevin McKidd) sister Megan (Abigail Spencer) returns and is livid when she learns he got Teddy (Kim Raver) pregnant and gave her his job instead of a ring. 'Dum-dum!' Watch this sneak peek of..